Oh what the hell – Cairns to Sydney to Bangkok to Taipei. I assume that years from now I’m going to look back on this entire adventure and wonder what in the hell was going through my mind. What encourages someone to undertake the journey I’ve had over a 2.5 day period – perhaps someone will have to write a psychology book about it someday. That journey was this: Leave a city you’ve only recently arrived at, hop on a 3.5 hour flight, lay around/sleep in an airport for 12 hours, board a 9.5 hour flight, wander through the Bangkok airport during a 1.5 hour layover, get on another 3.5 hour flight, go through immigration in a country that technically you don’t meet the entry requirements for (confirmed onward journey…uh…. ), and get on a city bus that you only think is going where you need to go. (For added excitement, after getting off that city bus, walk in the direction of your hostel and realize that most of the street signs are in Chinese, think you’re at the right intersection but not sure if you should go left or right, ask a stranger and have him tell you that you need to take a taxi about 20 minutes in a different direction, because it’s 1AM begrudgingly assume he’s correct and find a taxi, realize that the taxi has taken you to someplace that still isn’t where you are supposed to be, find an open wifi connection and realize on Google Maps that you’re nowhere near where you need to be, get another taxi and have him take you to a major landmark that you know is close to where you’re going, and eventually discover that you were one block away from where you needed to be when the stranger told you that you needed a taxi.) The overall timing of this entire adventure – August 5th at 2PM to August 7th at 2AM – I think a total travel time of 38 hours after you account for the time zone changes. As I’ve mentioned before – I’ve read a lot on this trip. Recently that has involved 3000 pages worth of Game of Thrones books, but there were many before that. One of the books I’ve read (over the course of one or two days on the beach in Koh Tao) was a somewhat famous backpacking book called “Vagabonding” by Rolf Potts. I think that the only possible way to explain what’s been going on in my head and with the later parts of this trip is through something that I recently discovered I “highlighted” in my Kindle. I don’t know what any of this means for me and what happens next. I’m off to walk around town and see if I can find anything worth taking pictures of. 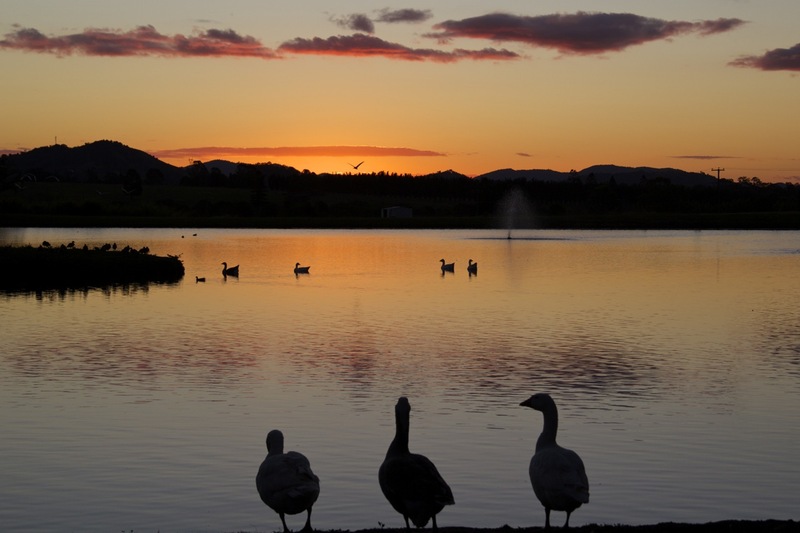 In the meantime, here’s a picture of some ducks enjoying the sunset…assuming ducks are capable of actually taking the time to enjoy a sunset. I’m hoping that later this evening I’ll finish writing about Cairns and Ayr Beach and get those photos uploaded as well. This entry was posted in What's up with Mike. Bookmark the permalink.